Ok. Enough 'a that. I was a guest over at White Lights on Wednesday last week and shared this goodness. Peanut butter. Cake. Made in like 3 minutes. I really don't think I need to say more, do I? Nope. Combine all ingredients in an oversized coffee mug. Whisk well with a small whisk until smooth. Microwave on high for 1 1/2 minutes and then take it out to check to see if it is done. If not, continue to microwave in thirty second intervals. Mine was done at 2 minutes. You don’t want to overcook it or it will become rubbery. You can also make this into two smaller-sized mugs. You can mix the batter all in one mug and then pour half into another mug. Make sure you cook each one individually. Oh wow. 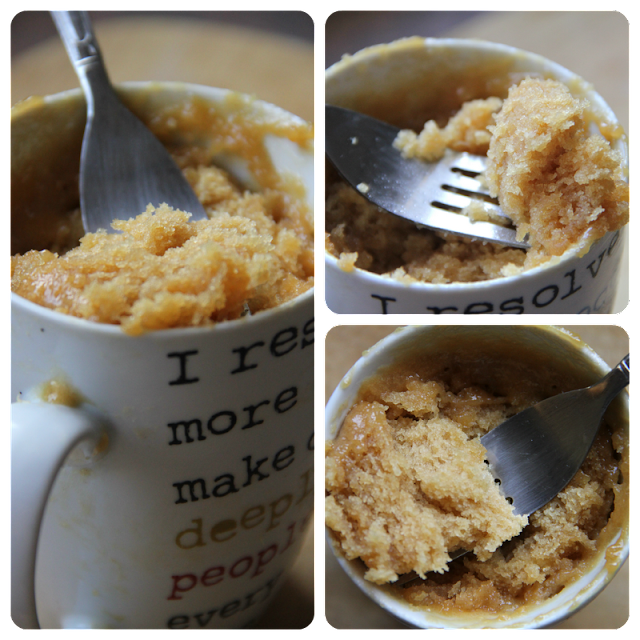 I think this might be my favorite mug cake of all time! I seriously can think of NOTHING BETTER than this! You are my hero. I thoroughly LOVE these posts!! I am a missionary in Costa Rica and found the miracle of mug cakes a few months back. This blog has totally brightened my day!!!! Wow! This SO good! I've done a chocolate mug cake before that was alright but this is incredible. I put some chunks of bittersweet chocolate in it too. OM NOM NOM! I just made this and it's so yummy! Definitely will be making it again. Yikes!! This is 1000 calories! Now I can't eat supper!! Will be making this a layer cake for 4!! Oh, and yeah it is a lot of calories if you make the whole thing, but it would be impossible to eat over half. I ate like 1/4 of it, and I was stuffed! This was so delicious. I had thought that a mug wouldn't be enough so I made a double batch in a bowl... I didn't eat even a quarter of it. I am so full but it was so delicious. I agree. I made mine in a bowl too. Only ate half. My kids love all of your single size mug cake/cookies! Plus, they can easily make it themselves. Another benefit is that I'm not tempted to eat the leftovers of a whole batch of cookies or cake! You are aware that 4 T = 1/4 c., right? Might help with the measuring. I made a LOW CALORIE HEALTHY version of this PB cake for myself. I'm positive the regular fattening recipe is WAY better (of course)! That's what my kids say ;) But, I can't afford to eat like that. So did a little experimenting. I replaced PB with the Powdered PB2 (you can purchase this product through Amazon). Added one Tablespoon of real peanut butter. I used 3 TBS wheat flour and 1 TBS white flour. Then I used stevia instead of sugar (or you could use honey). I did not add any oil at all. Next time though I will add some applesauce in replacement of the oil (without oil it was a bit dry). Anyhow, my low cal healthy version was good (not great - but it is healthier - hey, you can't have it all!) It tasted like healthy PB bread. Very filling. I could only eat half. I don't know what I did wrong... I just made this and it was so nasty. I'll just have to try again I suppose! Wow, I did not think a cake in the microwave for 90 seconds could be this good. The kids loved it! I just found this off pintrest and had to try it. I am amazed at how good this turned out. I tweeked it just a bit by adding 2 tablespoons of cocoa powder. I will be making this a lot more. Now I need to try the rest!!! also, i made your microwave pear crisp the other day and it was DELICIOUS. i'm going to try it with apples today, i'm expecting it to be equally delicious lol. Found your blog on Pin Interest - this recipe looks fabulous - going to try a gluten free version - hubby has celiac but loves peanut butter - who doesn't. Looking forward to visiting you often at Happy Place (love the name). Going to try with gluten free flour. We tried this recipe tonight with an adaption. Instead of 3 tablespoons of peanut butter we used 3 tablespoons of butterscotch chips. We melted them with the milk in the microwave for 30 seconds, then added the rest of the ingredients. It was so very tasty! just made it...put drizzled dark chocolate over top of it....WONDERFUL!!! As others have said, I added chocolate. Milk chocolate would've been better if I'd had it. My problem is that, when I got to the bottom, some of it was kinda almost burned, while other parts were still gooey and uncooked. Thoughts? Prepared this in a soup mug. Added chocolate chips on top. Yummy! I made this tonight in a bowl with 2 tbsp peanut butter, 1 tbsp Peanut Butter & Co. Dark Chocolate Dreams Peanut Butter, and a handful of mini chocolate chips. I swear, this thing could serve 4! It came out HUGE! II just made this and i have to say, it is awesome! I didn't use egg because i'm pregnant and don't want to take the chance that the egg doesn't get cooked well, but even without the egg it's still moist and delicious! I'm gonna make a whole bunch of these for my friends birthday! She LOVES peanut butter! Found your blog on Pinterest, I made two one was great but i over cooked the second :( But overall it was very good! combined chocolate and peanut butter chips, so good! I tried this tonight and wrote a review on my blog about it. VERY tasty. Love it. I threw in some peanut butter chips at the last second. It was definitely enough for 2 servings. Thanks so much! Yah, it's pretty rich for one person. Glad you enjoyed it! I have to say this was FABULOUS! I had heard of the 1 minute mug desserts and fell for the alleged results. I was a bit hesitant to try this but I was looking for one that seemed to be a viable recipe and this seemed to be the best fit. I added ingredients in the order they are listed above into a plastic bowl, whisked like crazy, poured it into what I considered an oversized mug put it in the microwave. I started with the 1 1/2 min mark as suggested but I found for my cups, it took 2 1/2 minutes to be finished. I was not expecting any decent result and I have to say I was more than pleasantly surprised that this recipe proved me wrong! OMG this was ridiculously delicious! And yes, as others stated, it was HUGE (but I guiltily ate the entire thing with some cream cheese icing. This is now a permanent part of my recipe file and will definitely be used for the occasional sweet tooth craving and for special occasions. BEST THING EVER!!!! Now I need to find more that are just as real as this! Disgusting. I am puzzled as to why so many people liked this. The only extra thing I added was a tad bit more sugar. Other than that, I followed the instructions exactly. I microwaved it for 1 minute, 30 seconds, then 30 more. I ended up with a bland sponge-like result. And this is definitely not enough for 2 or 3 people to share. It *mostly* filled an average-sized mug. This is awesome, I’ve made it twice today. I ate the whole thing! I'm stuffed! Thank you! Made some pb and banana icing ti go on top! So yummy! It tastes like a real cake, and is has the perfect sweet/ salty/ peanut butter combination. It makes a whole mugfull, so I had to finish it later, because it is very filling too. Yum! I made this as well and already made it several times myself. I did use apple sauce instead of oil and nixed the egg. I featured it on my blog as well, www.justanotherhispanic.com. شركة كشف تسربات المياه بمكة نقدم لك أفضل الخدمات إصلاح وتغيير وإستبدال جميع الأجزاء التالفة, سواء كانت هذه الأجزاء خاصة بالمطبخ أو الحمام أو الحديقة ويتم إيقاف تسرب المياه. This really hit the spot !!! Thanks so much for taking a moment or two of your time to leave a comment! I love 'em! All recipes, opinions, and photographs on this blog are mine unless otherwise stated. Please give the proper credit when you use one of my recipes. Please do NOT use any of my photographs. Thank you.